A weak near-term outlook has weighed on the stock in recent months. Shares of top video game maker Electronic Arts (NASDAQ:EA) declined 24.5% last month, according to data provided by S&P Global Market Intelligence. For context, the S&P 500 lost 6.91% in value. Electronic Arts stock was riding high in the first half of the year, up more than 30% year to date as of July. 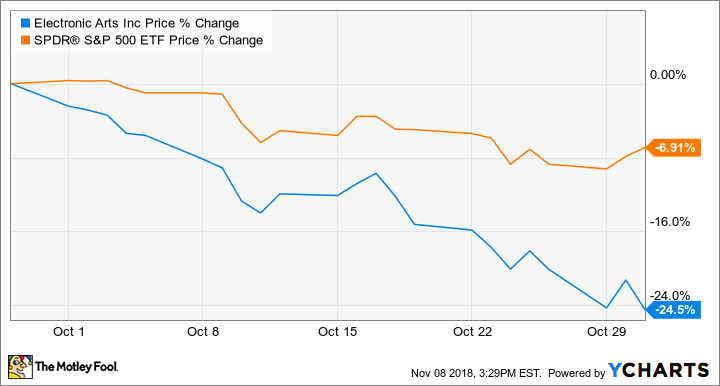 Entering the month, the stock was already trending down along with the broader market, but management's weak outlook given during the company's second-quarter earnings report in late October didn't sit well with investors. Electronic Arts delivered better-than-expected results for the second quarter. Revenue was $1.286 billion, or $16 million above management's guidance. That translated to net income of $255 million, which was way above management's guidance of approximately $150 million for the quarter. Screenshot of Electronic Arts' Battlefield V. IMAGE SOURCE: ELECTRONIC ARTS. The stronger-than-expected results weren't enough to offset the negative sentiment surrounding the game maker in recent months. Management announced in August that it was delaying the upcoming release of Battlefield V by one month into November. The delay caused management to lower full-year expectations for revenue, which has sent the shares tumbling over the last couple of months. During the recent second-quarter conference call, EA upset the apple cart again by issuing non-GAAP revenue (or net bookings) guidance of $1.725 billion for the holiday quarter, or more than $200 million lower than what analysts were expecting. Some analysts took that as a sign that EA's games are not standing out from a busy fall release schedule that has seen blockbuster releases from rival game companies, such as Activision Blizzard's (NASDAQ:ATVI) Call of Duty: Black Ops 4 and Take-Two Interactive's (NASDAQ:TTWO) Red Dead Redemption 2. Both games have been very popular with gamers since launching last month. Lost in the market's focus on EA's weak outlook was management's upbeat forecast for the fourth quarter due to strong early interest they are seeing for Anthem -- a new franchise releasing early next year -- and higher expectations for mobile game Command & Conquer: Rivals. Management maintained its full-year forecast for net bookings of $5.2 billion and earnings per share of $3.11. Wall Street analysts currently expect EA to report adjusted earnings of $4.57 per share for fiscal 2019 (which ends in March). That would represent growth of 3.4% over fiscal 2018. Looking further out, EA has got some things cooking that should leave investors feeling good about the company's long-term growth prospects. This includes a new cloud gaming subscription service and the strides the company is making on the esports scene with its Madden NFL and FIFA franchises.